Speedy overcame strong competition to take home the 2018 Sustainable Solution of the Year Award from The Lifting Equipment Engineers Association (LEEA) inaugural awards dinner. The award was given in recognition of the focus on increasing environmental efficiency and Speedy’s ongoing commitment to consider the impact on the environment, while maintaining profitability. 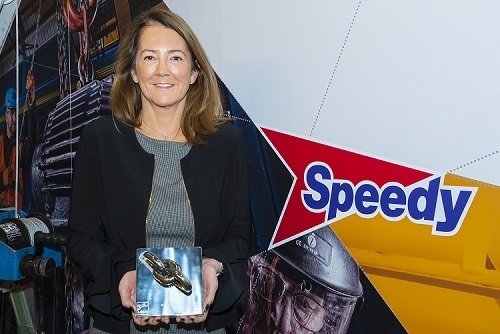 Lisa Blake, Specialist Services Director at Speedy said “Safety and sustainability are both at the heart of our business. They are key elements in our proposition in providing equipment and services to the lifting industry. We are delighted that our efforts have received such important industry recognition”. The Lifting Equipment Engineers Association (LEEA) is established across the globe as the leading representative body for all those involved in the lifting industry worldwide. It is the respected and authoritative representative body for its members who work in every aspect of the industry, from design, manufacture, refurbishment and repair, through to the hire, maintenance and use of lifting equipment. Its inaugural awards were held alongside LiftEx, the flagship event of the LEEA, which was this year held on 14-15 November at the Marshall Arena in Milton Keynes.